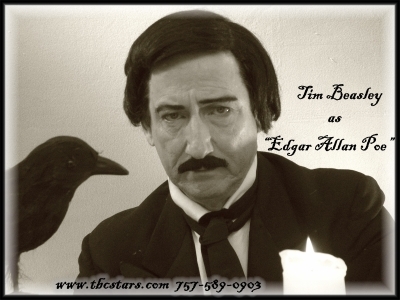 One of Tim's favorite "Dead Legends" to perform as is Edgar Allan Poe. As the original "master of the macabre’ ," Edgar Allan Poe holds a very honored place in the mind of Tim Beasley, an accomplished multi-media and live stage actor. Tim is well known nationally for his knack of bringing back many deceased popular celebrities and historical figures from the “dead” in his portrayals. Tim’s chilling portrayal of Edgar Allan Poe is not a séance, spirit possession or channeling phenomenon, but simply an uncanny ability to pull Poe’s deceased personality, literary mind and physical likeness back into the light of the living…. 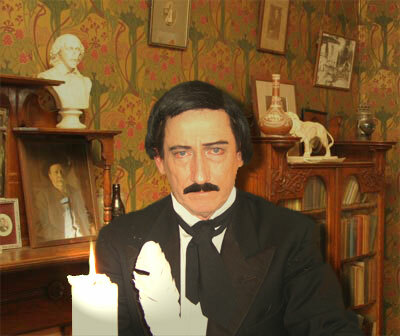 Tim’s impersonation mystically conjures up Edgar Allan Poe himself, in the audiences‘ imaginations, by breathing life back into the memories of Poe’s fabulous tales of terror and other literary masterpieces. As any fan of Poe’s will tell you, it’s the haunting memory of his poems and stories that eternally lock the listener to the chains of his tormented soul. Tim Beasley will enjoy bringing you and your guests an evening’s entire "Herd Of Nightmares" as he reads the classic Poe to you, as Poe would have himself….. These include the haunting poetic masterpiece "The Raven**" and the horrific "The Black Cat," "Telltale Heart," "The Pit and The Pendulum," "Premature Burial" and other gloriously ghoulish tales, plus the beautiful prose of his other poems like "Annabelle Lee." Tim is proud that he was engaged to perform "The Raven" and be co-presenter of the 2008 Private Eye Writers of America Shamus Awards banquet, held at Edgar Allan Poe's final resting place, Westminster Hall and Burying Ground, in older Baltimore, MD. This historical landmark and gothic style church is one of the most important of all Poe related locations. 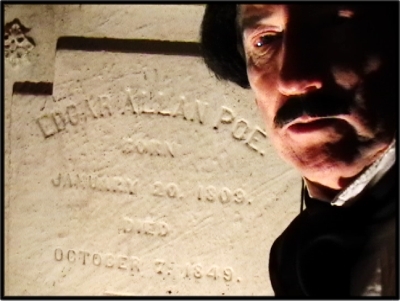 Tim Beasley as "Poe" has a quiet moment of reflection at Edgar Allan Poe's gravesite in the Westminster Burying Ground. Booking now, and also consider booking his other favorite “dead legends” appearances.